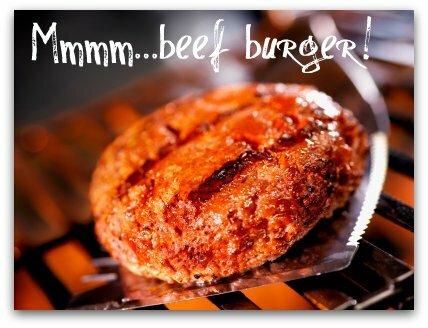 A beef burger recipe for the low carb dieter? Find many tasty choices here. I love a good beef burger recipe! Like you, I get bored with the usual charred meat puck with all the fixin's. A burger should be an explosion of flavors and not just a piece of gray meat on a bun! Of course in a low carbohydrate lifestyle, there are no buns, but you know what I mean. Obviously I have more than just one hamburger recipe, so here is the first of the lot. The rest will follow in time and in no particular order. Mix all ingredients together thoroughly. Shape into 4 patties. Don’t over-handle them, it makes them tough... just pat them gently and make a nice smooth shape. Refrigerate until ready to use. By the way, not only is this a great beef burger recipe, it's also great served as a meatloaf or made into meatballs!! Now time to make the Guacamole! In a small bowl, coarsely mash the avocado. Gently mix in the tomatoes and remaining ingredients. Chill thoroughly. Heat the grill to 300F or Medium. Place the burgers on the grill, drop lid down and cook 15 on one side and then about 10 minutes on the other. Check temperature with instant read thermometer. When the temperature reaches 150F remove from grill and cover with aluminum foil for 8-10 minutes for the juices to set and to allow the minimal internal temperature to rise to 160F. Serve with 1/4 cup of the Guacamole and a simple green salad with olive oil and vinegar.